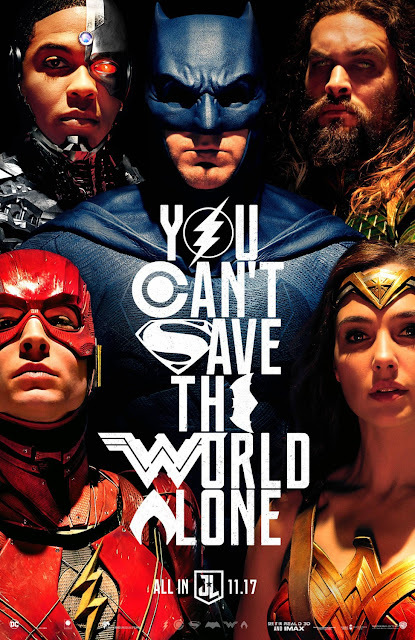 Chrichton's World: Review Justice League (2017): Maybe not epic but certainly enjoyable! Review Justice League (2017): Maybe not epic but certainly enjoyable! Justice League is a much lighter affair as it has discarded most of the pretension and darker nature that plagued previous DCEU films. In my opinion it's the closest thing to a proper DC comic book adventure next to Wonder Woman. And therefore made this is a very enjoyable viewing experience. However there are some problems that I will have to address. For some reason Warner Brothers found it necessary to keep the running time of the film a little under two hours. Normally I would applaud this decision since too many contemporary films are too drawn out and have very little substance to make it worth your while. In this case however I think it's a mistake as there is a lot of back story and character arcs that seem to have been cut short. You never really get to know Aquaman, The Flash and Cyborg. This is the first time (apart from their brief cameos in Batman v Superman: Dawn of Justice we get to meet them and then it's not acceptable to neglect their stories. I still don't understand why Warner Brothers is in such a hurry to catch up to Marvel. Since they would benefit greatly if like Marvel they would take their time to build up characters and their stories and then combine them in one film. Arrowverse has done the same and look what they have accomplished with their shows and crossovers. Established characters like Batman and Wonder Woman have previous appearances and films to rely on so there is no need to spend much time on explaining where they come from. BTW Gal Gadot was excellent. She has come a long way and hope to see more from here as Wonder Woman or other roles. It was nice to see Bruce Wayne cracking jokes and being less dark and moody. As far as I am concerned Ben Affleck can play Batman as long as he wants. I really don't want to invest time and effort to get used to yet another Batman. Steppenwolf was a weak villain. He is supposed to be very powerful and dangerous and yet he didn't seem that threatening. I don't think this was because he was fully animated. I did not found this to be troubling at all. The lack of back story and not showing enough evil or destructive actions on his part though did detract from the menacing figure he should have been. He was also very easily defeated. Now what is so fun about that? But I guess a case could be made for the Justice League and their effectiveness. Wile Justice League did deliver on action, laughs and feel good moments. It failed to bring weight or depth to the events. Despite it's scale and the super villain used it never felt epic which could have been remedied had they made Steppenwolf more menacing and tactical. They should have made him seem better prepared and unbeatable. Or they should have added more villains to make the situation more dire. Then it would have made a whole lot more sense for these super heroes to work together. One super hero in particular could have dealt with the situation all on his own which is cool of course but removes much needed tension that way. But to be honest I was prepared for the worst and did not expect to like it as much as I did. I even laughed at the bad jokes made by Ezra Miller as Barry Allen / The Flash. And I don't really like his Barry Allen. So yes overall Justice League is one of the better films in DCEU and I hope they will continue this trend.